I had to do a lot of digging through the old picture folders in my PC, for today's prompt, to find what I was looking for. I knew it had to be there somewhere, but it kept eluding me for a long long time. Finally remembered where it could be just this morning! Those are my school friends (S, A, G) and me, at my best friend's (S') place. Yeah, the same best friend who used to call me over to arrange her cupboards! (Refer to the comments in the post - "Orderliness..."!) She's the one in pink. I'm the one in the white cardigan... the only one wearing any woolens. (Remember, I'm hypothermic?) A is the one in checks. And G is the 4th one. By the way, these were all printed pictures (film-roll days) that I scanned and made a rough collage out of, in Photoshop. I decided to leave out some of the more... ummm... crazy pics. You can click on the collage to zoom in. The day these pics were taken, my best friend's parents were out of town. It was just her and her younger sister (T) in the house. (These pics were all taken by her younger sister, by the way.) So the 5 of us... all girls... had the entire house to ourselves, which used to happen very rarely in those days. Like... very VERY rarely! For one whole day and night, we were totally FREE! We cooked our own food... whatever junk we wanted to... and we stayed up as late as we wanted to... and made as much noise as 5 young carefree girls could possibly make... until finally, the neighbors started complaining! No kidding! Alright then, I am kidding. Or, not exactly kidding... just 'exaggerating' a little. This is my 23rd post for 2013 May Photo A Day Challenge. Link to the previous post: "Photo A Day - Change"
PJ parties are such fun with girlfriends! As i was in hostel in engg. EVERY DAY WAS A SLEEPOVER . Nostalgic post and ur sis's pyjamas r real good! Yeah, my sister always got such matching sets of PJs... so I knew there had to be a picture of her somewhere in one of those PJs! Glad I finally found it... otherwise, would have just gone ahead with my PJ party! I've never studied in a hostel... it was always day boarding and I did my Post Grad through correspondence. So never had too many opportunities for sleepovers. Used to share a flat with a female colleague back in Noida... and did have a lot of midnight tea-parties back then, as she was in the UK shift. But when you are working on your own, sleepovers don't mean the same thing anymore, do they? Hypothermia is just so irritating! I don't even feel like working on the PC in winters, 'coz my fingers get practically frozen up! u hv a 1000 wattt ka smile! 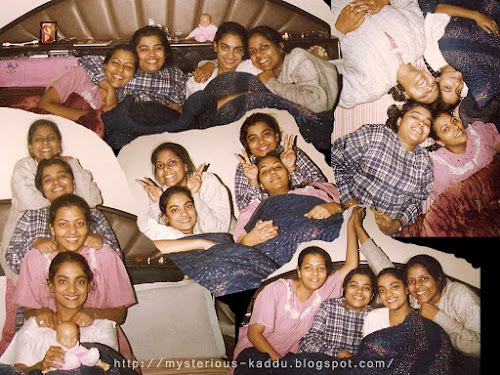 ha ha ha ha...the way the pictures are I can very well imagine how much fun you gals had!!! And ur sis ki smile is actually pretty!! She reminds me of Sridevi!!! Seriously! Memories of fun times! Your sister does have a beautiful smile. and her PJs are cute too!! You walked in uninvited. Now save yourself! He Came. He Read. And He Commented. Colorful Vegetables: Photo A Day - I Bought This!